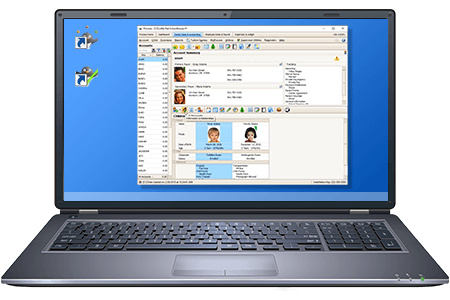 When electronically checking in/out parents or employees, it is ideal that you set up a computer dedicated solely to the task so there are no interruptions of usage on your administrative machines. Ideally, the check-in computer should be placed near your main entry for easy access by parents and staff. All-in-one computer, Full Color Touch Screen, Biometric ID Pad, Card Swipe ID, Point of Sale ready OS, Universal Mount. Learn more. The 8" Touch is a commercial grade all-in-one touch screen computer. Additional S&H fees will apply. Financing is NOT available on Procare 8" Touch units. Costs will vary based on the model and capabilities chosen. Please speak directly with a local PC specialist to determine what will be best for you. How quickly is the unit delivered after placing order? Delivery time from manufacturer is 7-10 days. You can buy units locally or online. If ordered online, delivery time will vary by manufacturer. How do I install the software and connect the check-in computer to my administrative machine(s)? You may need to speak with your local installer about this process. What do I need to run Check-In? Built in Biometric ID Pad or use the integrated Card Swipe reader for recognition. PC (Desktop or Laptop), Monitor and mouse. What add-on options are available? Since the 8" Touch comes standard with integrated options for Biometric ID Pad or Card Swipe, the only other items to consider is if your state requires the capture of signatures and if you want door access control. Manufacturer’s warranty: 3 years parts and labor. This will differ by manufacturer but a 1 year warranty is common. Both options provide the same benefits of capturing check-in/out times and communicating with your administrative computers on your center’s local area network. Either option will also work with our Data Hosting Service. 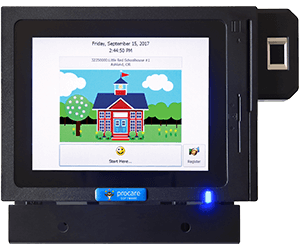 If you don’t need a small, wall-mountable unit like the Procare 8" Touch, a standard PC/laptop/tablet is fine and is often more cost effective. However if space, wow-factor and integrated features are attractive, then the Procare 8" Touch may be ideal for you. The family Data module helps us stay organized and compliant easily. We use the cloud based option and this has made my life so much easier. I can work from different sites as well as home and have access to all of the records and data needed to perform efficiently and productively. I have been a customer for a decade and could not think of using any other industry specific software.